Four years ago the Brazilian Federal Police coordinated the military occupation of an indigenous village. One Indian was killed and others seriously wounded. The Indians remain deeply traumatised, as a LAB journalist discovered in a recent trip. Those struggling to shape the Basin’s fate hold conflicting opinions, but because the Tapajós is an isolated region, few of these views get aired in the media. Journalist Sue Branford and social scientist Mauricio Torres travelled there recently for Mongabay, and over coming weeks hope to shed some light on the heated debate that will shape the future of the Amazon. This is the third of their reports. Pariwat in the Munduruku language means both non-Indian and enemy. Perhaps if the police in charge of the Eldorado Operation had known this word, they might have carefully considered the proud warlike character of the Munduruku people, and their complex, troubled relationship with the “white” world. Instead, the authorities ordered a group of heavily-armed, ill-prepared men into the indigenous territory, where language, cosmology, political and legal systems, values, and, even, ways of thinking, are very different. All with predictable results: the federal raid on the Amazon indigenous village went terribly wrong. One Munduruku Indian was shot dead, others still suffer from debilitating wounds, while the confrontation has done profound, long-term damage to relations between the Munduruku nation and the Brazilian state. The story of that day’s events, hidden by an apparent police cover-up and never fully told in the press, is presented here — Mongabay’s reporting has also resulted in the launch of a judicial action being brought against the government by the Federal Public Ministry. As with so many indigenous conflicts during Latin America’s history, the Eldorado Operation was all about gold. It was launched in November 2012, when a Federal judge in Cuiabá ordered the destruction of barges illegally dredging for gold in the indigenous land of the Munduruku, Apiaká and Kayabi peoples living along the Teles Pires River in the Tapajós Basin, at the heart of the Amazon. Federal Police officer Antônio Carlos Moriel Sanchez headed up a National Public Security Force detachment to do the job. Representatives from Funai, Brazil’s Indian Agency, and Ibama, the environmental agency, also took part. In an explanatory note issued just after the violent raid, the Federal Police named their objective: to dismantle a criminal scheme in which legitimate companies, known as DTVMs (Distribuidoras de Títulos de Valores Mobiliários / Securities Distribution Companies) illegally bought up gold in the indigenous territory. These companies, acting as middlemen on Brazil’s financial and capital markets, reportedly served as money laundering platforms, concealing the gold’s illegal origin, with highly profitable results for investors: more than R $150 million (US $46 million) in ten months. What made this praiseworthy operation problematic was that it didn’t just go after the companies, but also set about cutting off the gold at its source — with the police destroying the gold mining barges. Though the mining itself was illegal, it had gone on peacefully for years, and was making a significant contribution to the indigenous economy. The Munduruku have mined gold since the 18th century. From the 1970s onward, after it was discovered that the world’s largest gold deposits lay under their land, the Indians played a more active role in its management, aware that they ran a risk of their territory being invaded by swarms of autonomous gold miners if they didn’t exert control. Child showing rubber bullet wound, with a gas grenade in foreground. Photo: courtesy of Movimento Ipereg Ayu. Gold mining has long provided the Munduruku with useful income, without which they would find operating in the modern world difficult. Gold also powered indigenous mobilization against the construction of hydroelectric dams in the Amazon. It helped fund the Munduruku’s two occupations of the Belo Monte mega-dam construction site on the Xingu River. And until recently, Munduruku gold helped fuel the Indians’ international campaign against the 40+ dams planned for the Tapajós Basin — the Munduruku’s home territory. All this meant that, whether he knew it or not, when the Cuiabá judge ordered an end to gold mining in the Tapajós Basin, he was attacking a long-time source of Munduruku income (which the indigenous people saw as legitimate). More than 13,000 Munduruku live in 112 villages today on the upper reaches of the Tapajós River and its tributaries, including the Teles Pires River. This warlike culture once occupied and completely dominated an extensive Amazonian region known to European colonists as Mundurukânia. Though much reduced in size and power today, Mundurukânia remains its own world with its own rules and rituals — customs that the Federal Police and indigenous agency, Funai, apparently failed to consider. One of the targeted gold mining barges operated near the indigenous village of Teles Pires. It was owned by a Munduruku Indian named Camaleão, who lived in a neighboring village, and with whom the Teles Pires people had a close relationship (some local Indians even worked occasionally on the barge). The federal officials’ first mistake: the police and Funai held a five-hour meeting with the Teles Pires Munduruku on 6 November 2012, and those in attendance agreed that the barge would be destroyed. The authorities considered this meeting to be conclusive. The Munduruku did not. Within their tradition, agreement requires many meetings, with every community member. That’s because, as anyone who has spent time in a Munduruku village knows, the community isn’t hierarchical, but is horizontally organized. Nothing is ever decided by the vote of a few. All must agree, and consensus reached for action to occur — no matter how long it takes. Any person arriving in a Munduruku village must follow rigorous protocol, as we learned on our trip to Tele Pires last November. We had been invited to visit in advance, and arrived as expected, tired after a long river trip. Still we had to wait quayside while a young warrior announced us to the cacique and requested our entry to the village. After a few minutes the man returned and took us to the communal hut, for the first of many meetings negotiating our journalistic goals. We were introduced to the cacique, the vice-cacique and other Indians waiting to receive the pariwat. They all donned ceremonial clothes for our visit — the women in straw skirts, their faces painted with designs signifying the tail of a bird known as a ukpisuesue; the men hefting bows and arrows, their bodies painted with lozenge shapes resembling a jabutí (turtle) shell, a mythical creature that always defeats its powerful enemies through clever stratagems. At last, we were guided to our room to sleep, and the next day awoke to a bell, calling us to a collective breakfast. Then more speeches. We worked out a program for our visit, but it wasn’t adhered to and often found out quite suddenly that a new activity had been arranged. The only constants were the daily meetings, at breakfast and in the evening. We gradually discovered that the agreed to program, though altered, did not mean it wasn’t important: it functioned as a prescribed ritual. (Those seeing this as strange might ponder how a Munduruku warrior would respond to the formal protocol surrounding a visit to Buckingham Palace or the White House). As bewildering as this was to us, we soon understood that not to follow protocol was to commit a serious misdemeanor. Indeed, it was precisely these rituals that the Brazilian state attempted to crush in its centuries-long effort to “assimilate” the many indigenous nations into a so-called “national society”. Early on the morning of 7 November, the day following the first Munduruku meeting, the armed police arrived abruptly, by helicopter and speedboat, and immediately set about destroying the gold mining barge. In a disastrous clash of cultures, the Federal Police misinterpreted the Indians’ wearing of ceremonial clothes. In their explanatory note, the police erroneously claim that the Munduruku had prepared “an ambush” where “over 100 Indians in war paint attacked with firearms and bows and arrows about 35 policemen”. The reference to “firearms” appears to be wrong too: according to a report drawn up by the Federal Public Ministry (MPF), an independent unit of the Brazilian state, and also according to the Indians we spoke to, none of the Munduruku had weapons, apart from their ceremonial bows and arrows. The note also refers to “authorized telephone recordings”, which proved that “an attack on the police was planned”. None of these recordings has ever been produced. The note also fails to mention the fact that an Indian was shot and killed. The Federal Police did not reply to Mongabay’s request for an interview. The police’s disrespectful eruption into the village angered the community. Then, things escalated, according to the MPF. Camaleão, the barge owner — likely furious at the prospect of losing his US $500,000 investment — approached officer Sanchez and told him to stop destroying his property. Sanchez reportedly pushed Camaleão, and then another Indian, Adenilson Krixi Mundurku, bumped into Sanchez. According to Indian witnesses, Sanchez stumbled on the steep, slippery riverbank and fell into the river. Standing in water up to his waist, Sanchez shot Adenilson three times in the leg. He too fell into the water. Subsequent examinations confirmed that Adenilson was killed by a shot to the nape of his neck. Or, in the words of the MPF, he was executed. The killing triggered further violent police action. They began firing live ammunition and rubber bullets, and throwing tear gas bombs. The Indian warriors defended themselves by shooting arrows, wounding a few policemen. Several Indians were injured, a few seriously. Some Indians tried to record what was happening with their cell phones. The police seized the phones and destroyed the memory cards, but some Indians hid their phones so some footage survived. Edvaldo Moris Borô Munduruku was seriously hurt, with bullet shots in his back and his arm. He said that his arm was already splintered when the police came into his house but they twisted it further. Seventeen men, including the wounded Eurico Kirixi Munduruku, were taken prisoner and removed to a jail in Cuiabá, the capital of the state of Mato Grosso, a large city they had never seen before. The men were disoriented, not knowing where they were, and fearful they would never be allowed back home. In interviews with us, two of the men said that they wanted to tell us what had really happened. While in custody, they had begun by telling the truth and blaming the police officer for the violence and for the death of Adenilson, but under police intimidation they changed their story. Four years later, the horror of the Eldorado Operation is still very real for the Indians. The remains of the exploded barge remains at the quayside, a daily reminder of the terror they lived through. Some Indians have not recovered from their wounds. Edvaldo Moris Munduruku, whose arm was broken in two places, has suffered long term effects: his forearm has atrophied and he can’t move his fingers, so can no longer work the land. 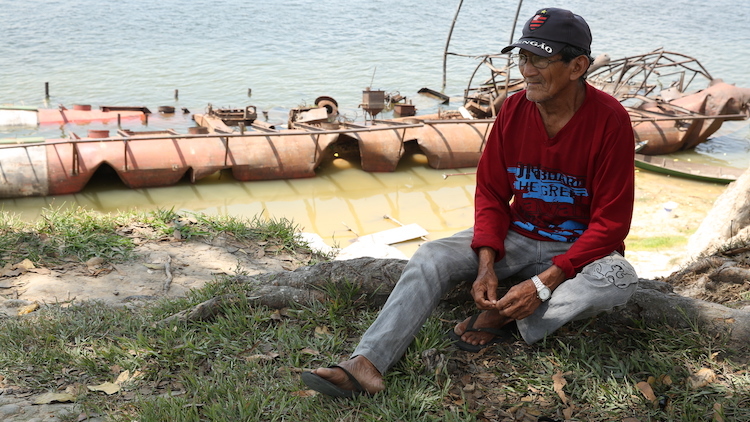 The elder, Eurico Kirixi Munduruku, can’t move his right arm: “I can’t fish any more. I don’t have any movement in my right arm, only in the left.” He can’t even throw manioc flour into his mouth with his right hand, as all the other Indians do, but has to use a spoon, which he finds mortifying. Children are scared when they hear a helicopter overhead. People cry when they talk about the raid. The community has completely lost faith in Funai, the indigenous agency, which, they say, did nothing to protect them. The Federal Police were shaken by the outcry following Adenilson’s death. The Eldorado Operation was halted and never resumed. Although police officer Antônio Carlos Moriel Sanchez has not been charged with any offense, we were told that he has been posted to Bolivia, where he carries out minor duties. We requested an interview with him to hear his version of events but were not given one. However, it appeared to us outsiders that the community would take a long time to regain its old confidence. Although there is no evidence that the authorities intended the Eldorado Operation as a means of weakening the Munduruku that is one consequence. The loss of their gold mining barge means that the Indians can no longer finance their campaign against the Teles Pires and Tapajós dams. Hearing of our visit, MPF Prosecutor Janaína Andrade de Sousa asked to see the video interviews we had shot in the village and she decided on 17 November 2016 to begin proceedings against the Brazilian state for the “collective moral damage” inflicted on the Munduruku Indians that day. It is highly unusual for a prosecutor to take such action on behalf of an indigenous community, and she is demanding a large compensation payment — R $10 million (US $2.9 million). Unfortunately for the Munduruku, the blows suffered by the Indians in the Teles Pires village did not end with the Eldorado Operation. Just a few months later, the consortium building the Teles Pires dam destroyed the sacred site of Sete Quedas — a holy site that is comparable to the Christian “Heaven,” a fearsome blow that is still reverberating through the Munduruku culture. More assaults on the indigenous communities may be imminent, with the Temer government, National Congress, and agribusiness lobby (bancada ruralista) moving steadily toward approving a vast industrial waterway along the Teles Pires River. This commodities transportation route would destroy other sacred sites, and disrupt the Munduruku’s traditional lifestyle and livelihoods — ruining fishing grounds and bringing major deforestation that would impact hunting. This may, however, only be the first of many modern assaults on the indigenous way of life. In the process of researching this article, we discovered that Vale S.A., one of the world’s largest mining companies, has obtained mining rights for the soil beneath the Teles Pires village. Mining on indigenous land is currently forbidden under the Brazilian Constitution, but this could change rapidly if a new mining law already in Congress, and supported by the powerful mining lobby, is approved. Vale S.A. is well known in Brazil for the callous way in which it has treated indigenous people in the past. It was also the parent company responsible for Brazil’s worst environmental disaster on the Rio Doce in which 19 people died in a wave of toxic mud, and which polluted the length of the 440-mile river all the way to the Atlantic Ocean in November 2015. While the Eldorado Operation raid shook Munduruku society to its psychic core, the people remain united as a warrior nation. After all, they are the descendants of the great “head choppers,” known for their war-like behavior until the start of the 20th century. And they’ve overcome many challenges in the past, surviving the coming of the rubber barons, land grabbers and other Pariwat. Today, they stand firm, with their legion of male and female warriors, backed by the god of all creation, Karosakaybu. To our eyes as visiting journalists, they seem ready and willing to courageously face down the Brazilian government, the agribusiness lobby and the dam builders.